pureWOD PRE Review | Pre-Workout Supplement | Does It Work? PRE is a pre-workout supplement made by a supplements company called PureWOD. They market 'all natural' products, including a 'beef protein powder'. PureWOD claim to have beaten other pre-workouts "without adding artificial ingredients, or under dosing the effective and expensive ingredients" - but this is strange, as they've under-dosed some key ingredients, and left others out completely. Read on to find out about PRE's ingredients. 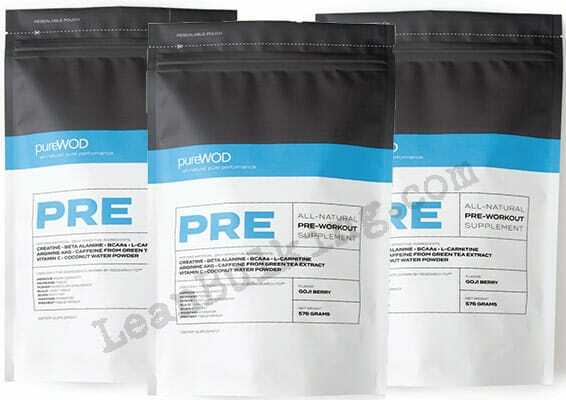 PureWOD PRE contains 8 ingredients that claim to improve your gym session. 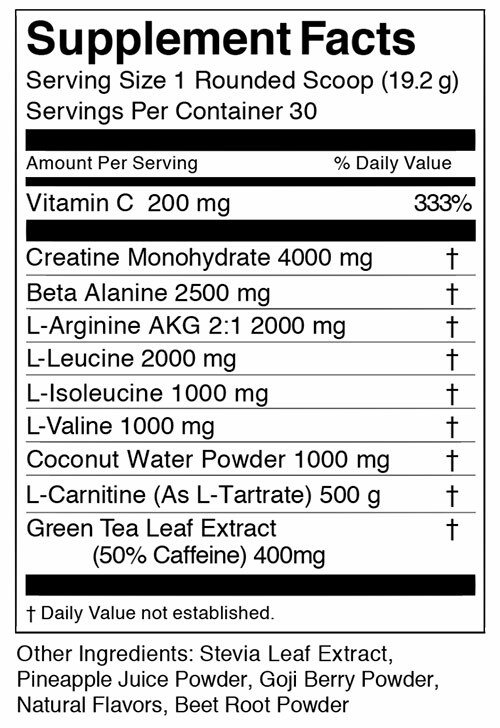 After looking at it's ingredient list, we're happy seeing Citrulline Malate, L-Carnitine, Coconut Water Powder, and Caffeine on there. But there's some bad news: a few of pureWOD PRE's ingredients can cause side effects, or aren't worth being in there. We'll take you through the good and bad things about this pre-workout's main ingredients below. Used for decades by bodybuilders and fitness fans for one reason: it works. What does it do? Well, It helps improve your strength and endurance in the gym, so you can lift more, for more reps and sets; to make more muscle gains! A common ingredient in many pre-workouts, but that doesn't mean it's good. While it can improve muscular endurance, it's known to cause paresthesia in doses over 0.8g-1g. PureWOD PRE contains 2.5g of Beta-Alanine, so you're at high-risk of suffering from paresthesia (tingling on the skin of your face, chest, hands, fingertips and toes). This is a key pre-workout ingredient when dosed correctly; Citrulline Malate can improve your muscle pumps in the gym. But only when it'd dosed between 6,000mg-8,000mg. Unfortuantely, this pre-workout ingredient only contains 1,500mg, meaning it might not have any effect here. Also known as Branched Chain Amino Acids, these three nutrients have shown to boost muscle protein synthesis (muscle growth). But BCAAs aren't necessary to supplement, as they can be consumed through a well-planned diet (which you should be following anyway). Not only that, they're very cheap to buy separately. PureWOD could've included a more beneficial ingredient here, such as Beetroot Extract which can improve your endurance and muscle pumps. A very useful ingredient, which can help keep you hydrated throughout your gym session. How? Because it contains a high-level of electrolytes, to replace what you sweat out and help you perform at optimal levels. The salt from L-Arginine, it's believed to help raise your nitric oxide levels, which would improve muscle pumps. But there's a problem - L-Arginine has a poor absorption rate, meaning it's ineffective when orally supplemented. L-Arginine AKG hasn't been studied very much, so it's unreliable; but as it's extracted from L-Arginine, it's not likely to be effective when orally supplemented either. This is a great 'brain booster', as it improves your cognition (alertness, focus, and memory), as well as reducing fatigue; keeping you fresh for your next workout. Improved focus leads to better mind-muscle-connection, so you make the most of every rep and make more progress on your fitness goals. PureWOD claims that this is 50% Caffeine, which would be a perfect dose (150mg). You should aim to consume 150-200mg per serving, to experience benefits such as improved focus, strength and endurance, without risking any side effects like jitters or energy crashes. There's only one ingredient that puts you at risk of causing side effects in PureWOD PRE; Beta-Alanine. The other ingredients shouldn't cause any side effects, unless your allergic to any. Contains Creatine Monohydrate, Citrulline Malate, L-Carnitine, and Cocunut Water Powder - all key pre-workout ingredients. We like that PureWOD have made an all natural pre-workout without artificial flavors. Our favorite pre-workout supplement is free from artificial flavors and sweeteners, so it shows that PureWOD have very good intentions here. However, they've under-dosed Citrulline Malate by only adding a tiny 1,500mg - instead of the optimal 6,000mg-8,000mg, which shows a lack of research or willingness to spend more on quality ingredients. We recommend searching for a pre-workout that contains more key ingredients.